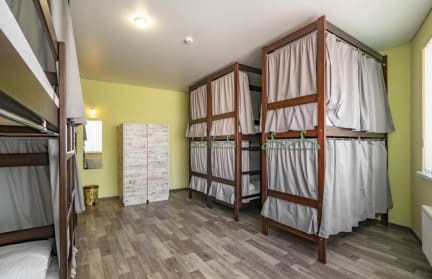 Station Hostel is a brand new modern hostel located near the main train station in Kharkov offering private rooms and both mixed and female only dorms, spacious lounge area including a fully equipped kitchen, dining area, flat screen TV, board games, etc. Station Hostel is a 15 min walk from the city center and all main attractions, Kharkov International airport is 9 km from the property. A 24 hours front desk is available, free luggage room, free Wi-Fi and laundry. There is a refundable deposit for keys and towel. No drinks or food in the rooms. After cooking and/or use the kitchen please clean and wash everything. Wow! My first hostel experience and it could not have been more perfect! Spotlessly clean, friendly staff, comfy bed. Well equipped kitchenette. And so reasonably priced. If I ever find myself in Kharkov again you can be sure I will be staying at Station Hostel again! Hi there, i enjoyed my stay at station Hostel it's very new and clean and secure. The service is perfect over here the stuff are pretty friendly. The hostel in general is very modern and nice, but breakfast was NOT included in the price and when I tried to ask about it they didn't understand it because of poor english of the staff.